Place the chicken breasts into a Chinese tall, ceramic soup pot. Add the dried yam, red dates, goji berries, and ginger (if using). You may need to pack these ingredients tightly into the pot. 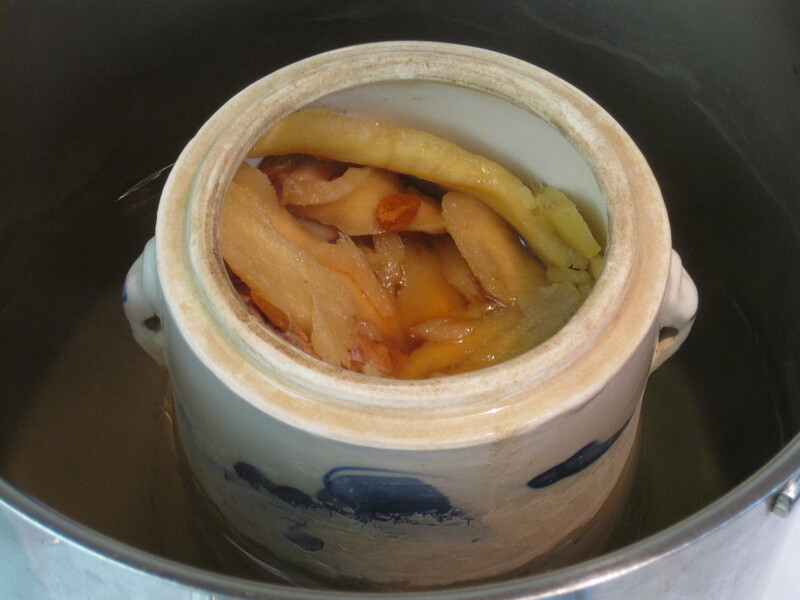 Gradually pour the glutinous rice wine into the ceramic pot plus 3 tablespoons of water. The liquid should come up to 1 inch below the top of the pot. Cover the pot with its lid. Set up a large, tall stock pot on the oven burner. Place a wire rack on the bottom of the stock pot and place the ceramic soup pot on the rack. Pour water into the stock pot around the ceramic soup pot until the water level comes up to 3/4 of the height of the soup pot. Cover the stock pot with its lid. Turn the heat on high and bring the water to a rolling boil. Then reduce the heat to medium low or medium heat to maintain a strong simmer for 3 hours. 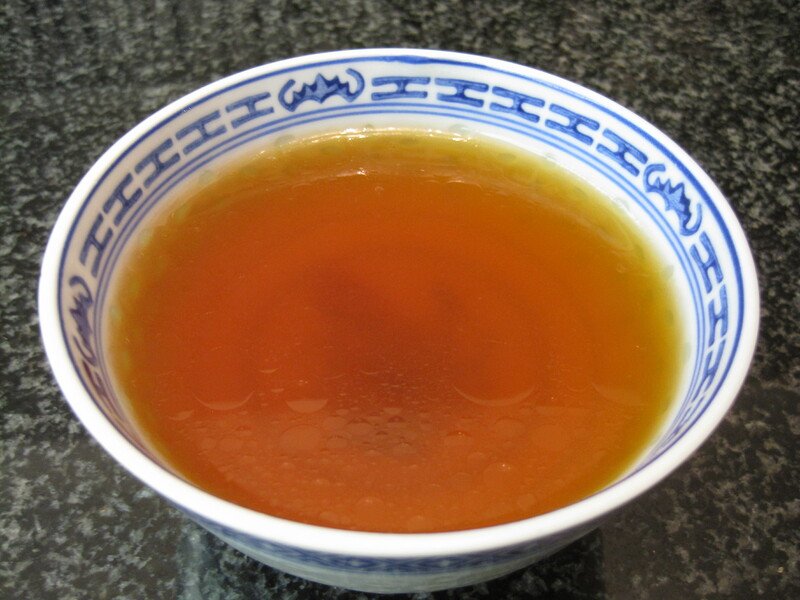 Ladle out the soup from the ceramic pot and serve hot. The chicken absorbs a lot of the flavour of the soup. So if desired, you could make a second pot of soup by reusing the ingredients from the first soup. Simply add water to a pot of leftover soup ingredients, bring to a boil over high heat, and reduce the heat to maintain a simmer for 30 minutes, covered. The second pot of soup is still very flavourful. I’m so happy that you have many traditional recipes (this & the pigs feet w. ginger in black vinegar!) The only person that I knew to make this soup PERFECT was my grandmother (I don’t have her recipe). Thank you in advance! This is something I want to make for myself and my daughter when she’s old enough to have children of her own! LOVE! Hi Jane, Thank you so much for writing! I really hope that my grandmother’s recipe will remind you of your grandmother’s soup 🙂 Let me know how it goes! Also, there are more traditional Chinese soup recipes coming over the next few months, so be sure to check once a month or so. This sounds good, especially in the winter. And I think it could be worked into a crockpot recipe as well. Hi Jeanine! Thanks for your comment! I just recently started experimenting with a crockpot. Let me know if it works for you! I recognize some things as health enhancers, such as the goji berries and ginger. I have both, will have to dig them up for this soup, as It sounds like it would make a good soup, or even a base for other soups with chicken and vegetables. Thanks so much for your comment! Those two ingredients are definitely used in all sorts of Chinese soups. You could try adding it to your favourite chicken noodle soup.